Leading 100% Export Oriented Unit of sandalwood animal paper cutter, sandalwood raja rani paper knife, sandalwood paper cutter and wooden paper cutter from Jaipur. Our organization has successfully expanded its business in market owing to the offered elevated quality array of Sandalwood Animal Paper Cutter. This cutter is well designed from the finest quality basic material and high-end technology. Our offered cutter is available in various colors and attractive designs that are so eyes striking. The offered range is highly demanded by the clients for its excellent features like perfect finish, everlasting shine and so on. Moreover, clients' can avail the entire range at industry leading prices. 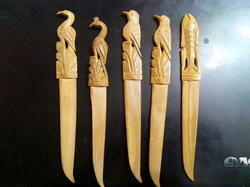 Keeping track of latest market development, we are actively engaged in offering a wide assortment of Sandalwood Raja Rani Paper Knife. The offered knife is designed with the help of supreme quality wood and modular tools in compliance with the set industry standards. 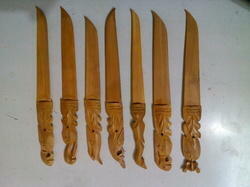 Further, or craftsmen make available this knife in various colors and designs for our clients. Moreover, this knife is provided with hook to hang it properly on the wall. 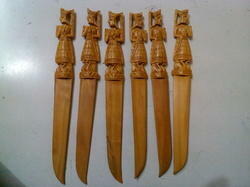 Clients can avail this knife from us at affordable price.